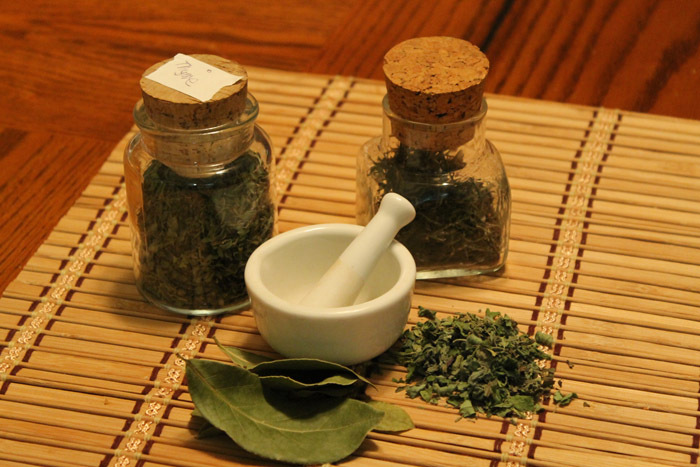 There are almost as many culinary herb mixes as there are herbs. Following are a few of my favorites. Equal parts dryed chives, parsley and chervil. I like to add thyme and oregano too. Fresh from the garden mediteran oregano, basil, garlic (this can be dried chips), parsley, sea salt and fresh ground pepper to taste. I place the dried or freah herbs in cheese cloth to make a tea bag type of package. I use parsley, sweet bay, thyme and celery - I like a pinch of garlic too. Oregano, garlic, basil, rosemary, lemon pepper and a pinch of cinnamon. Dried or fresh dill or dill seeds, garlic, thyme, lemon pepper, and a pinch of rosemary and oregano. Rosemary (I like lots), sea salt, fresh ground pepper, sweet bay leaf, garlic. This is really good if all the herbs are fresh. Share your favorites in my comment section.